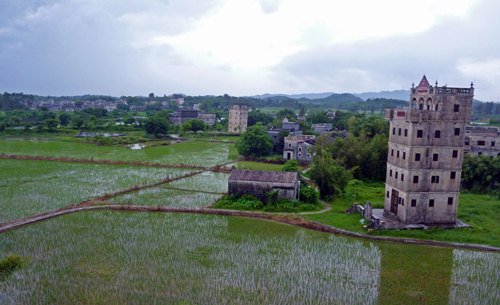 Zili Village 自力村碉楼群: The setting of Zili’s Diaolou (Click here for a Diaolou definition) is the embodiment of bucolic China. 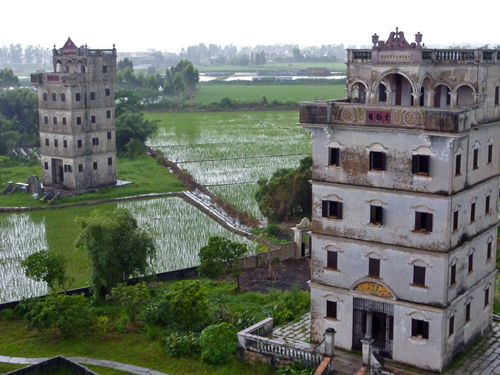 They appear amidst shimmering green rice fields, dotted with hoe- carrying peasants, dressed as they were when the Diaolou were built a century ago, with the odd water buffalo to put the icing on the pastoral cake. 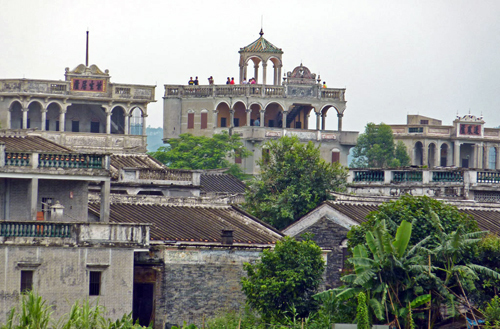 Zili village is more than just its Diaolou. The village boasts a peculiar mixture of sturdy peasant houses with beautiful eave roofs and delightful alleys. A couple of those houses on the square near Zili Village 自力村碉楼群 entrance have been converted into an interesting folk museum, showing traditional furniture, farming implements, as well as photos and historical records. 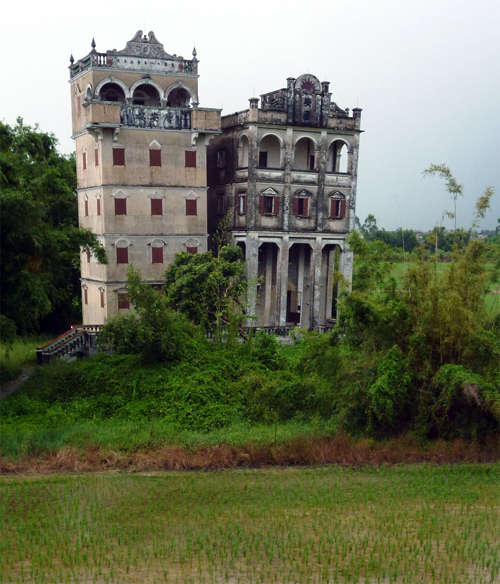 Most of its startling Diaolou lie on the outskirts of the village, as if sprouting out of the rice paddies. To reach them you have to cross a large lily-pond, covered in quivering, plate-sized leaves. Some of the Diaolou stand alone, while others are in clusters, leaning into or away from each other, like bamboo swaying in the wind. 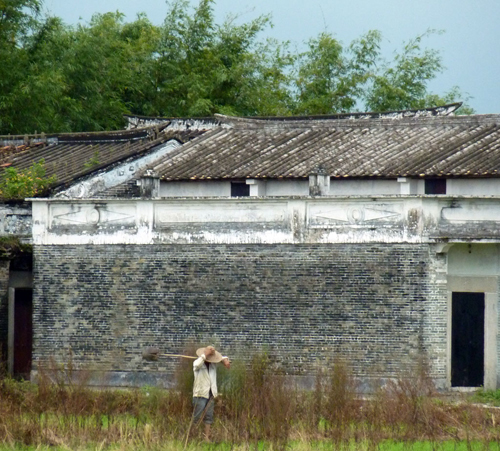 Their interiors are quite bare, but many still hold the original farming implements used throughout the centuries by Chinese peasants. Zili is a place to wander and explore. 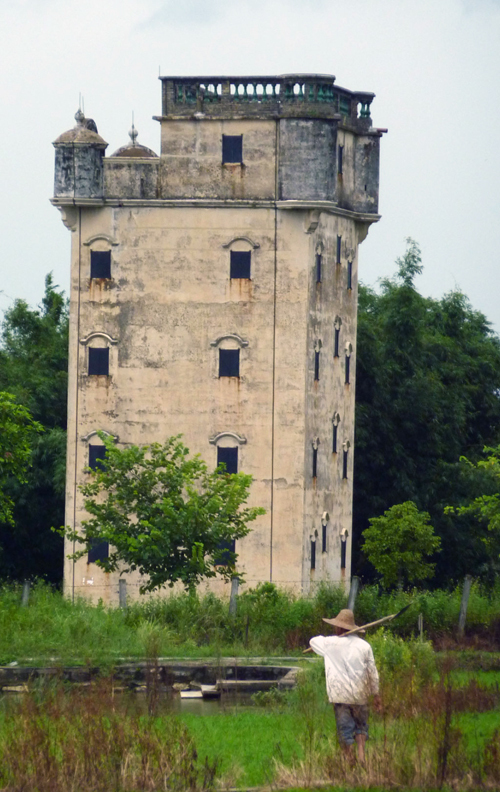 Climbing to the roof of a Diaolou has to be the highlight of any visit. All the buildings have balconies and rooftop terraces, some with little pavilions perched on top, from where you get amazing views over the other Diaolou and the surrounding countryside. Any city dweller will envy the Diaolou owners: it’s impossible to imagine what such views and space would cost in a big city! 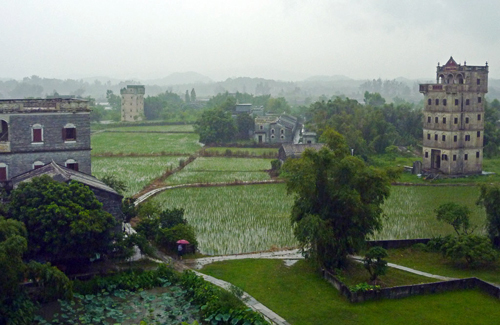 Being so close to the Li Yuan (Li Gardens), Zili receives its fair share of visitors. 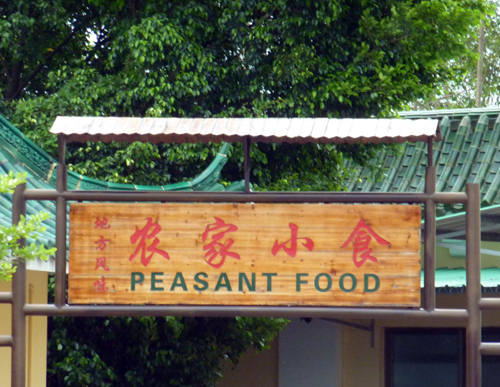 The savvy locals quickly cottoned on to the urban Chinese’s desire to go back to their roots and they have set up a string of peasant food restaurants. 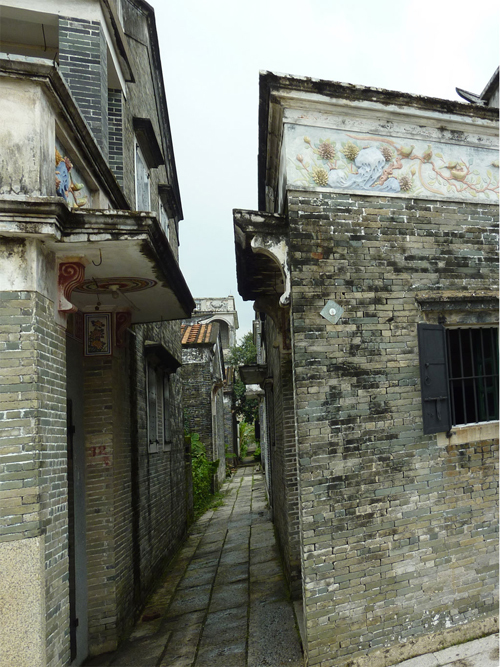 What may be uncool, or uncouth, in Shanghai or Guangzhou is all the rage when urbanites visit these villages. Simple pork and rice dishes are the most popular; and ‘pork’ includes just about every part of the pig, especially offal. Chicken and a variety of rustic greens, tofu and boney fish, raised in the village’s own fish ponds, are also on offer. So follow the example of the Chinese tourists and round off your visit to Zili with a hearty peasant meal, washed down with a couple of beers. 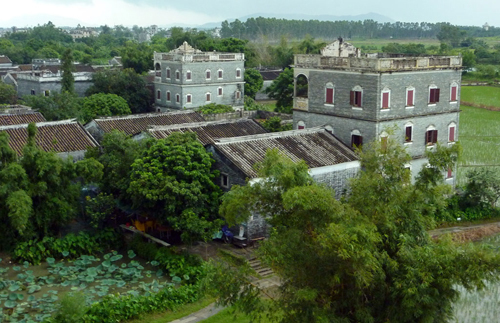 Zili Village is a couple of kilometers from the impressive Li Gardens (click here for previous post). 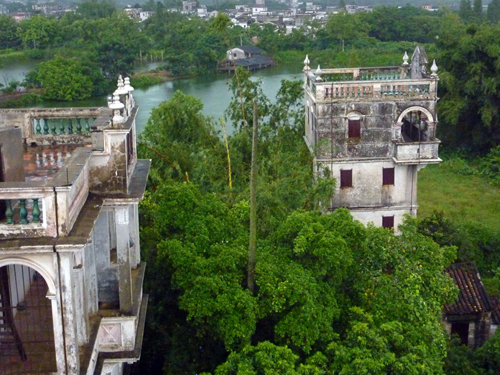 If you’re not hiring a driver, many local buses from Kaiping’s Yici 义祠 bus station pass by the Li Gardens, some will make the detour to Zili or it’s a pleasant 2 kilometer walk. Getting to Kaiping is no sweat; there are buses from all Guangzhou bus stations, though it can be difficult to get an exact timetable. 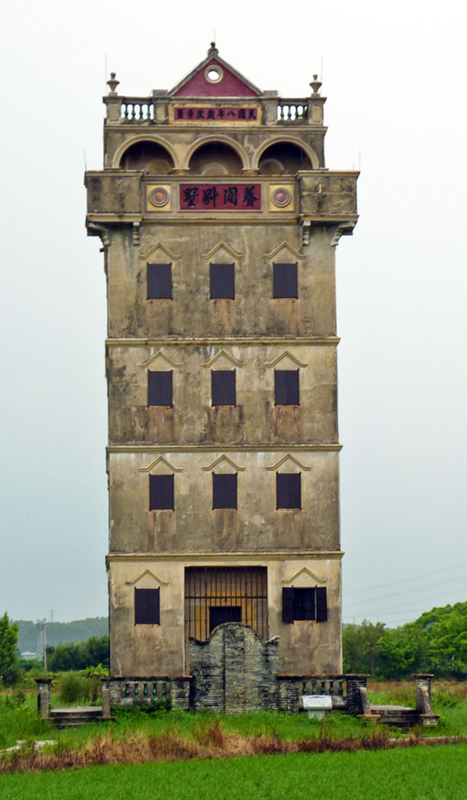 As we were staying on Shamian Dao / Shamian Island, we used the nearby Fangcun bus station. To get there from Shamian Island, take subway line One from Huangsha and get off at Kengkou station and cross the bridge. There are hourly buses, 60 Yuan, 2½ hours. 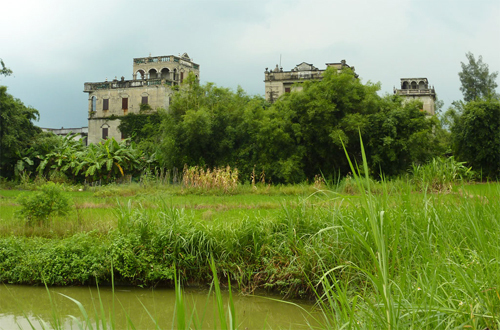 They leave you at Kaiping’s new Yici 义祠 bus station, which is a few kilometers away from the central Kaiping Binguan and the waterfront. Regular buses from Kaiping also go to Shenzhen, Zhuhai, Zhaoqing (the one we took when we were leaving) and Hongkong.